Our mission is to achieve better health for vulnerable communities in Australia and internationally by accelerating the translation of research, discovery and evidence into sustainable health solutions. The Institute’s ambitious new Strategic Plan 2017-2020 is driving our commitment to making an even greater contribution to improving the health of vulnerable communities around the world. We are proud to share our strategic blueprint to create a more focused, program-led organisation, one that harnesses our remarkable technical breadth to solve devastating health problems. Burnet is an Australian, unaligned, not-for-profit, independent organisation that links medical research with practical action to help solve devastating health problems. This sets us apart from other organisations. Burnet brings together a highly diverse skill base, with more than 400 staff and students working across cutting-edge research and projects to address some of the most relevant global health issues. Harnessing our international and local field presence, our laboratories, and our mixed development and research cultures, drives a greater focus on the most relevant health issues, and achieves a greater impact as as result. Whilst our headquarters is based in Melbourne, Australia, we have offices or representatives in Myanmar, Papua New Guinea, China, Lao PDR and in Zimbabwe. We are also actively involved in various research and project activities in a range of Asian, Pacific and African countries. 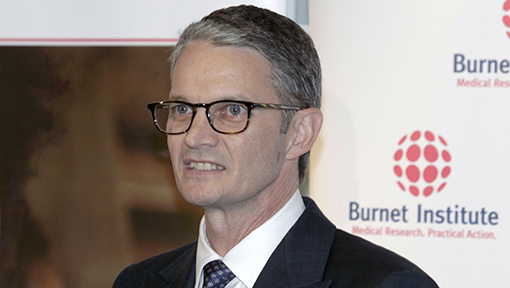 Burnet Institute has attracted a world-class leadership team featuring internationally-renowned scientists and researchers, headed by Director and CEO Professor Brendan Crabb AC, an award-winning malaria researcher. Supported by a dynamic Board, chaired by Ms Mary Padbury, Burnet’s leadership team values excellence, innovation and social justice, and shares a desire to extend the boundaries of knowledge and understanding. Read about our latest work in IMPACT Newsletter. Subscribe today! From the earliest days at Fairfield Hospital to the latest laboratory breakthrough, read about Burnet’s rich history in the special 30th Anniversary edition of IMPACT. Burnet Institute is named in honour of Sir Macfarlane Burnet OM, AK, KBE who received the Nobel Prize for Medicine in 1960. Sir Macfarlane, one of Australia’s most distinguished virologists and immunologists, is honoured each year when an outstanding international or Australian scientist delivers the Burnet Oration. We are the only unaligned organisation in Australia that has dual accreditation with both the Australian National Health and Medical Research Council (NHMRC) and the Department of Foreign Affairs and Trade. Burnet Institute welcomes feedback from our stakeholders and uses this information to improve the quality of our work, improve efficiency and if necessary to take remedial action to address issues raised. Burnet Institute takes all complaints seriously and will handle these in a timely and sensitive manner protecting the privacy of stakeholders. Burnet Institute’s complaint-handling policy is available for download. Complaints should be made by contacting Burnet Institute’s Head of Public Affairs by calling +61 3 9282 2111, emailing feedback@burnet.edu.au or in writing to Head of Public Affairs, Burnet Institute, GPO Box 2284 Melbourne 3001. Burnet Institute is a member of the Australian Council for International Development (ACFID) and should you feel your complaint has not been completely satisfied then you can contact ACFID at: Private Bag 3, Deakin, ACT, 2600 or by calling +61 2 6285 1816, or emailing main@acfid.asn.au.